On 26-29 of November 2012 in Baku was held the 40th Plenary Session of the Parliamentary Assembly of the Black Sea Economic Cooperation (PABSEC). The delegation of the National Assembly of the Republic of Serbia, headed by Predrag Marković, acting delegation head comprised delegation members Sanda Raskovic Ivić and Bojan Kostres. The two-day event was focus on economic, trade, technological and environmental, legal and political issues. The next, 41st PABSEC plenary session will take place in the Bulgarian city of Varna, on May 21-23, 2013. 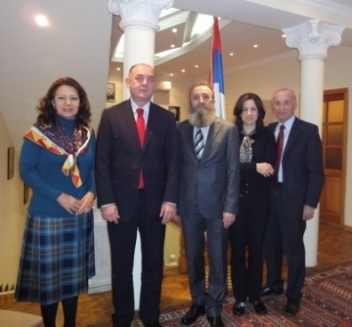 The Serbian delegation also has visited the Embassy of the Republic of Serbia in Baku and had a meeting with Ambassador of Serbia Mr. Zoran Vajović.